Let´s make 2016 the year of co-design! Have you ever thought of designing new experiences and exhibitions together with a multidisciplinary team? Maybe even get your audience involved in it? It's not only rewarding to bring different expertises and points of view together, but it's also cost-efficient and fun! You can now take advantage of our experience and start your own co-design workshops today! Because we have put together a neat little booklet that tells you all about different methods of co-design. It includes simple but effective templates and examples. And the best part? You can download it for free from mesch-project.eu/co-design. We love to hear from you! Give us a shout out on Twitter or discuss co-design with us on Facebook and let us know your own experiences with our templates. Selfies, like this Teddy Bear's with one of our smart objects at Museon, are welcome too! Or you know what? Just surprise us! Co-design, for us, means bringing together a broad range of different stakeholders and expertise to join forces in creating new interactive experiences for museum visitors that bridge the physical and digital realm. The video above gives you an impression of a co-design workshop. 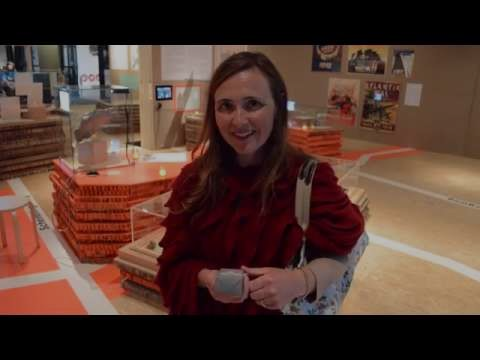 Video: Do visitors like meSch technology? What do visitors think of using smart replicas of real museum objects in an exhibition? We've asked them and the outcome will surprising you! On 20 November 2015 meSch, together with Acuity Design and Digital Identities, organised its second GLAM Innovation Lab, a one-day workshop aimed at providing cultural heritage professionals with practical tools to start innovating and use technology in exciting new ways. Read more. The Loupe is an augmented reality tool that can be used intuitively to explore digital information about museumobjects. Its use was so popular amongst visitors of the Hunt Museum, that the museum decided to reintroduce it for another exhibition. Read the whole story. meSch was present at the Online Educa Conference in Berlin, that was held at the beginning of December 2015. We hosted a workshop that was geared towards educators, letting them explore the meSch technology as a potential educational tool. Read the blog post. February 14 - 17: TEI2016, Eindhoven, The Netherlands. February 27 - March 2: CSCW2016, San Francisco, USA. April 6 - 9: MW2016, Los Angeles, USA. April 14 - 15: Identity Matters: enriching heritage to meet a new era, Amsterdam, The Netherlands. May 7 - 12: CHI 2016, San Jose, USA. June 9 - 11: ECSITE2016, Graz, Austria. MeSch project (2013-2017) receives funding from the European Community’s Seventh Framework Programme ‘ICT for access to cultural resources’ (ICT Call 9: FP7-ICT-2011-9) under the Grant Agreement 600851. Copyright © meSch-project.eu All rights reserved.